Psycopaths, megalomaniacs, paranoids or sociopaths? Paul Rosenberg's longish article (although we've added our pics and memes as usual) at Alternet.org, "The Sociopathic 1 Percent: The Driving Force at the Heart of the Tea Party," explains that "...in their warped view of society, only the individual exists -- with no social relations, shared history and culture." "'The sociological imagination Mills calls for is a sociological vision, a way of looking at the world that can see links between the apparently private problems of the individual and important social issues.' – Oxford University Press." "'I always said that if I wasn’t studying psychopaths in prison, I’d do it at the stock exchange.' – Robert Hare, creator of the Hare Psychopathy Checklist and its variants, the most widely used diagnostic tools for psychopathic personalities." "In 1998 the International Sociological Association listed radical sociologist C. Wright Mills’ book “The Sociological Imagination” as the second most important sociological book of the 20th century. As is only natural with such an influential work, there are differing interpretations of what’s meant by sociological imagination, but all involve some relationship between individuals and society. Lately, however, we’ve been exposed to a completely opposite sort of imagination, one that sees only individuals in isolation, and seems incapable of grasping even the most basic of social facts connecting them with each other. Call it “the sociopathic imagination,” because sociopaths are defined by their lack of empathy, conscience or any form of intuitive social awareness. "We’ve seen this most strikingly in a recent wave of attention to some bizarre thinking of the 1 percent. It was sparked by billionaire investor Tom Perkins, with his letter to the editor of The Wall Street Journal, in which he compared public criticism of the 'one percent' to Nazi attacks on the Jews, and suggested we were on the road to another Kristallnacht, which was reinforced by the remarks of others, such as billionaire real estate investor Sam Zell, who supported him. "'These are the people who did not go to their kid’s soccer games. These are borderline sociopathic people and they don’t care about other people,' Hanauer said, to which Hayes responded, 'I don’t want to diagnose anyone from afar, I just want to stipulate.' That’s an honorable, well-meaning liberal sentiment. But it’s a bit misplaced, particularly since it meant a missed opportunity for deeper understanding. The point isn’t to stigmatize any one particular individual, but to identify and arm ourselves against a pervasive, corrosive mindset. It’s a mindset devoid of empathy or conscience, for whom other people simply are not real, a mindset that has gripped us collectively, ever more tightly, over the past 30 to 40 years, regardless of how much mayhem it creates, as the richest 1 percent has roughly tripled its share of income, while the rest of us, collectively, have seen our incomes stagnate, despite rising productivity, year after year after year. "Remember Margaret Thatcher’s remark, 'There is no such thing as society, only individuals'? That’s the sociopathic mindset in a nutshell. Of course, Thatcher added, 'and their families,' an obligatory conservative feel-good trope. But as Hanauer told Chris Hayes, 'These are the people who did not go to their kid’s soccer games.' In short, Thatcher was lying when she tacked on 'families.' 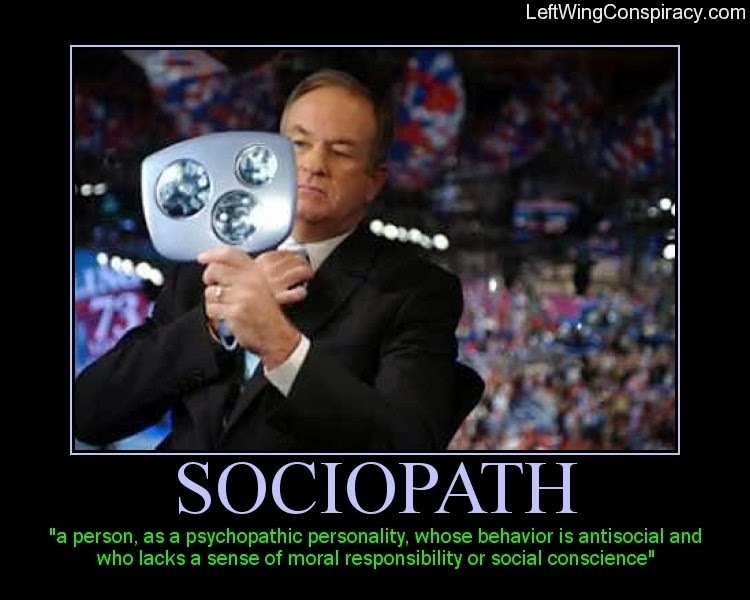 Sociopaths are like that — they lie a lot. "They lie when they call themselves 'job creators,' for example. As Hanauer says, the real job creators are the consumers, whose demand for goods and services is the only thing that keeps businesses going, thus creating all the jobs — including those of the 'job creators,' too! "Is everyone who supports such cuts or uses such language a sociopath? No, of course not. Only a very small fraction are, at best. But the influence of sociopathic thinking is far broader than we realize, particularly since it’s almost never recognized as such. That’s precisely why we need more awareness of the workings of the sociopathic imagination — the forms it takes, the impacts it has, the conditions in which it flourishes and spreads. 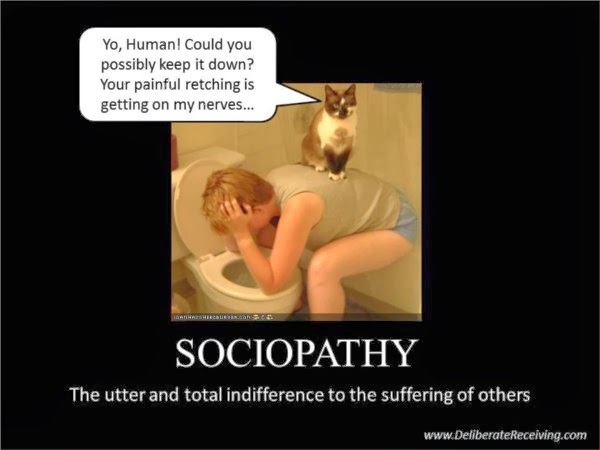 "First, however, we need to be clearer about sociopathy itself. It doesn’t help that the terminology is fragmented, and that interpretations differ. 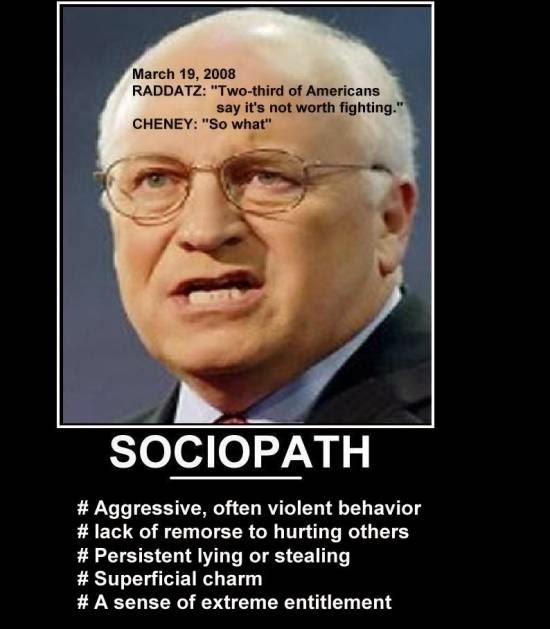 'Psychopath' was the officially sanctioned term until the 1950s, when the American Psychiatric Association changed the classification of psychopathic personality to sociopathic personality. A decade later it changed again to antisocial personality. 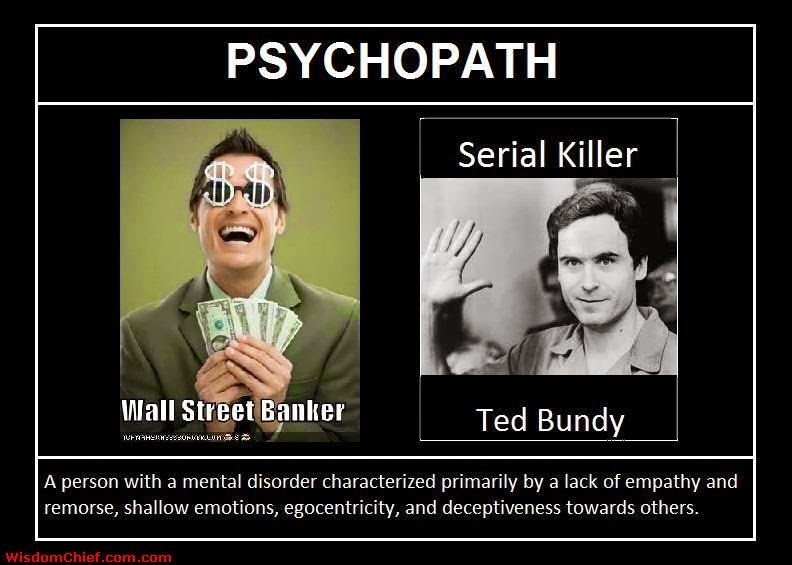 But the two historically most important researchers in the field both used the term 'psychopath' (more on them below), and significant subsets of researchers retain different meanings or favored usages. "It’s been argued that psychopaths have been taken to be more commonly criminal, even violent, and the result of genetic hard-wiring, whereas sociopaths are interpersonally rather than physically destructive, and the result of a difficult or abusive childhood. This is has little impact or no impact on the present discussion. 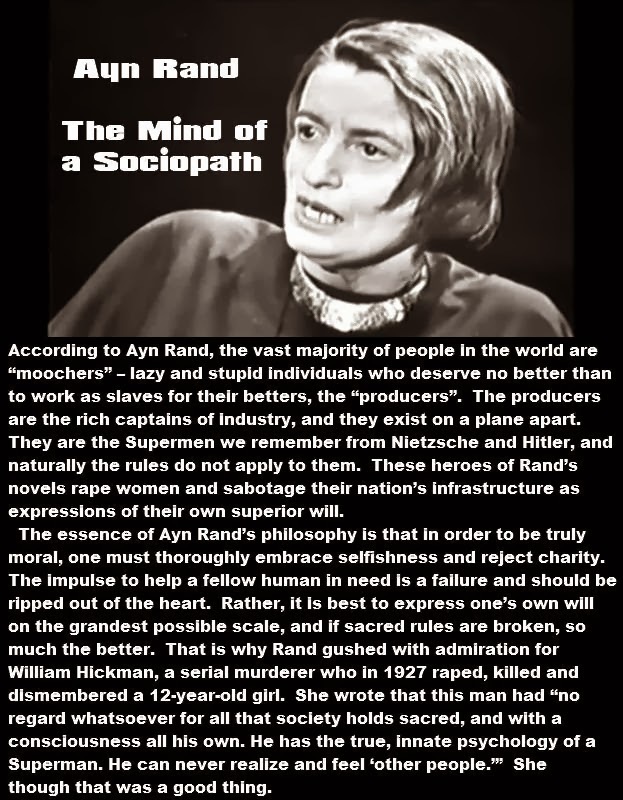 It’s also been argued that sociopaths have a sense of morality, only it’s a different one than the rest of society, perhaps, in which selfishness is a virtue, and altruism a vice, as per Ayn Rand. This is relevant to this discussion, as the influence of psychopaths on the larger society clearly involves altering, if not violently reversing the common sense of morality. That’s why I will tend to use the terms interchangeably in a broad sense, reflecting the usage of the experts I’m referencing, but favor 'psychopathy' with respect to specific behavior and 'sociopathy' to describe broader societal impacts. There is also a further small subset of psychopaths who deserve special attention: those who are serial killers (not that all serial killers are psychopaths — they aren’t). As it happens, Ayn Rand chose a serial killer as the model for the protagonist of her first novel, which means that we cannot honestly ignore this small, but vividly illustrative sub-population. "The second figure is Dr. Robert Hare, who developed a rigorous 20-point checklist (the Psychopathy Checklist PCL, and its revised form, PCL-R) based on rigorously testing Cleckley’s 16-item clinical profile, as well as a wide range of other research. Hare had a more critical analytical approach which further discerned four major groupings that accounted for 18 of the 20 points, and also developed variant checklists for specific sub-populations. (See Hare’s website, article for Psychology Today and professional paper describing his work in relation to Cleckley’s.) Hare also argued that psychopathy is dimensional (more or less) rather than categorical (either/or). Each checklist item is scored 0-2, with normal people scoring 3-4, 'moderate' psychopaths scoring 20, and full-blown psychopaths (1% of the population) scoring 30 or more. Hare’s dimensional view enables us to understand psychopathy as distinct phenomenon, epitomized by extreme examples, yet also recognize its continuity with a broader population range. "This is not an incidental relationship. It is directly tied to the rise of junk bond/leveraged buy-out financialized capitalism, which rebranded itself as private equity following its initial bad press in the late 1980s. And that in turn has been justified by the “Myth of Maximizing Shareholder Value”, as Naked Capitalism’s Yves Smith recently described and debunked it, building on an earlier analysis. Maximizing shareholder value was the rationale; the result was a dramatic reorientation of corporate behavior, favoring short-term (quarterly) profits to the virtual exclusion of all else, including concerns related to goodwill, reputation, corporate citizenship, etc. "One can summarize four main flaws Smith identifies with this viewpoint: First, she notes, 'Legally, shareholders’ equity is a residual claim, inferior to all other obligations.' So the whole concept is without legal foundation. It came out of Harvard Business School, in a 1976 paper by Michael Jensen and William Meckling, and it said what some people wanted to hear, period. End of story. Second, maximizing shareholder value doesn’t work. Smith notes,'as John Kay has stressed, when companies try to "maximize shareholder value," they don’t succeed.' The most profitable companies are not the most profit-oriented ones, but the most visionary and innovative ones. Third, even worse, it’s downright toxic. 'Jensen himself, in 2005, repudiated his earlier prescription precisely because it led to fraud,' Smith writes, going on to quote from an interview in the New York Times, in which he laments a common outcome in which 'even basically honest people move around the corner to outright fraud.' The situation Jensen described is custom made for psychopaths — and for those who aren’t, it creates an environment in which sociopathic behavior is far and away the path of least resistance. "The end result of all this was not just a corporate environment in which psychopaths and sociopaths could flourish; it had the effect of turning corporations themselves into sociopaths, as their traditional responsibilities to multiple stakeholders were tossed on the rubbish heap in the name of short-term profits to maximize shareholder value. That was the point of 'The Corporation,' a 2003 Canadian documentary that took the concept of 'legal personhood' to its logical conclusion, asked 'What kind of person is it? ', and concluded that the answer was 'a sociopath.' Hare was even interviewed for the film, which is the most successful documentary in Canadian filmmaking history. This is yet another instance of the sociopathic imagination — once you’ve accepted the basic logic, casting aside all social obligations you simply can’t imagine any way they could be put back again. "Smith made two other points worth noting here. First, that the impacts of leveraged buyouts went far beyond the firms taken over, to the entire corporate community: 'To forestall takeovers, many companies implemented the measures an LBO artist might take before his invading army arrived: sell off non-core divisions, borrow more, shed staff.' That’s why 'The Corporation' could credibly argue that corporations as a whole are sociopathic, not just a few selected ones. Second, Smith noted that Jenkins added even more fuel to the fire with his '1990 Harvard Business Review article, "It’s Not What You Pay CEOs, but How," that led to an explosion in the use of option-based pay and resulted in a huge increase in CEO pay relative to that of average workers. "Pure bull, of course. Zell understands better than anyone the crucial importance of how he and his cronies get paid — and how that depends on others not getting paid. In fact, it depends on them getting screwed, as Hayes went on to point out. Zell bought Tribune Corporation — which owns the Chicago Tribune and the LA Times just for starters — for $8.2 billion in 2008, in a classic, heavily-leveraged deal (with some of the money even coming from employee pension plans!). But less than a year later Tribune went bankrupt, with $7.6 billion in assets and $13 billion in debt. 'More than 4200 people lost their jobs, but despite the company’s troubles, executives got tens of millions of dollars in bonuses,' Hayes pointed out. 'Try doing what Sam Zell did if you’re not in the one percent,' he added. How exactly were those 4200 people supposed to emulate Sam Zell, you might ask. Good question. They could poison their dogs, but then what? How do they actually getpaid? "In Zell’s imagination, he’s the swashbuckling, risk-taking job creator. But in the real world, the only risk he really took was with other people’s lives — and the jobs he created were counted in negative numbers. Zell’s not alone in this. He’s not the exception, he’s the rule. In a 2012 appearance on CNN, Hanauer pointed out that neither Google’s Stanford-educated creators nor the venture capitalists who backed them took on any real risk. The only ones ever at risk were the pension funds whose capital the venture funds drew on. "It wasn’t always thus. Once upon a time the CEO did better because the company did — and that meant its employees, suppliers and shareholders all did better, too. During the 'golden age' of American capitalism, from 1947 to 1973, GDP grew 4.0% annually, with 4.8% unemployment and substantially higher income gains for the bottom 99% (4.1% per year) than the top 1% (1.8% per year). CEOs typically made 20 or 30 times what their average employee made during this era. But the 1970s brought a prolonged crisis to American business, with Europe and Japan finally fully recovered from World War II, the two OPEC oil shocks and stagflation. Jensen and Meckling’s shareholder value thesis was just one of many failed attempts to find a way out. It just happened to be the one that caught on, because it did find a way out for one small demographic — Sam Zell and his 1 percent cronies. From 1973 to 2011, GDP growth slowed to 2.7% annually, unemployment rose to 6.5% and income growth shifted entirely to the top 1% (4.8% annually) with no growth at all (0.0% annually) for the bottom 99% as a whole. CEOs now make 200 to 350 times more than their average employees. "These figures obviously refute the whole 'job creators' narrative — but only if one is actually impressed by the real world. Sociopaths, by their very nature, are not. They also utterly destroy the whole “equality vs. opportunity” frame that Chris Christie tried floating to defend Perkins, Zell and his own rapidly dwindling Wall Street donor base. They clearly show that the reality is exactly the opposite of what Christie claimed: historically, broad equality has meant far more opportunity for many more people. Again, Christie could not care less. 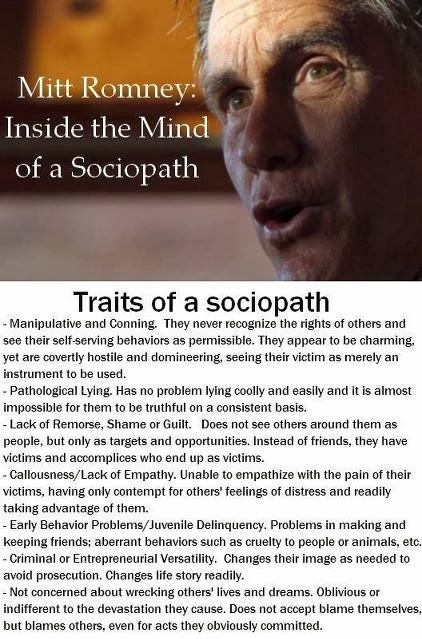 Does that mean he’s a sociopath? Not necessarily. But he is promoting the sociopathic imagination. What more can you ask from a GOP politician? "As I said, of course Zell knows the importance of how he and his cronies get paid. And how that depends on others not getting paid — even getting screwed. That’s absolutely central to how his wealth is accumulated. But that sordid psychopathic reality is entirely divorced from his virtuous hard work rhetoric (which actually was plausible once upon a time, but hasn’t been for going on 40 years now), and connecting those facts is simply beyond Zell — it’s beyond the reach of the sociopathic imagination, which cannot see coherent social realities at all, but only fragmented individuals and episodes, the better to manipulate them. "What I’ve just described is all about what economists call microeconomic behavior — the behavior of individual actors and firms — though I have made note of the macroeconomic effects, what it’s done to our economy as a whole. But one can also look at the macroeconomic story more directly — and the same sort shift toward a more sociopathic world can be observed that way as well. Enter Hyman Minsky’s financial instability hypothesis. (Summary paper by Minsky here.) He published a book-length treatment, 'Stabilizing an Unstable Economy,' in 1986. It might not have been able to predict the exact timing of the crisis — no one sociopathic investor could make a killing off of Minsky’s insight. But he did explain how a sound, stable economic order actually produces a dynamic that moves the economy increasingly toward greater and greater instability over time. It provides a community of non-sociopathic citizens with the insight and judgment to see through and reject the policies that actually hasten and worsen the crisis enormously. "One can think of Minsky’s financial instability hypothesis as composed of three main parts. First is its basic definitional identification of 'Three distinct income-debt relations for economic units, which are labeled as hedge, speculative, and Ponzi finance.' Hedge financing units are those that meet all their financial obligations by their cash flows. Speculative finance units can pay interest on their liabilities out of cash flows, but cannot repay the principal — they have to roll over their loans when they come due. Ponzi units cannot pay either interest or principal out of cash flow — they must sell assets or borrow. 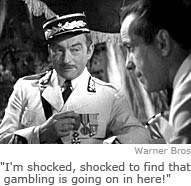 Ponzi units, in particular, exemplify the form that corporations have increasingly taken on via leveraged buy-outs or, as Yves Smith noted, in defense against such buyouts. They are custom made for psychopathic CEOs to thrive in. "The first theorem of the financial instability hypothesis is that the economy has financing regimes under which it is stable, and financing regimes in which it is unstable. "The second theorem of the financial instability hypothesis is that over periods of prolonged prosperity, the economy transits from financial relations that make for a stable system to financial relations that make for an unstable system. "In short, as long as hedge units dominate in the economy, markets generally tend toward equilibrium and stability, as the hallowed imagery of the “invisible hand” promises all markets must. As long as these conditions prevail, everyone’s prosperity really is intertwined. But when speculative and/or ponzi units dominate, the market tends toward a speculative boom-and-bust cycle, the sort that actual real-world economies have been exhibiting as far back as economic record-keeping extends. Those cycles exist because hedge unit dominance tends to return after a bust, producing a relatively stable regime, which in turn becomes increasingly unstable over time, leading to another crash. "While conventional economics sees instability — and, ultimately, crisis — as the exception and equilibrium as the rule, Minsky argues the exact opposite: equilibrium is actually only a phase that economies pass through on the way to their next crisis. We were in a particularly extended period of equilibrium after World War II, due to the depth of the crisis we had dug ourselves out of, and the extent of reforms put into place. But Minsky saw the signs of returning instability as far back as the 1960s, when he began publishing his work on the financial instability hypothesis. "Of course, there was significant damage to the economy even before the crash, as the shift toward an increasingly risky economy also involved shifting risk onto those least able to deal with it. This was the subject of a 2006 book, 'The Great Risk Shift: The Assault on American Jobs, Families, Health Care and Retirement — And How You Can Fight Back' by Jacob Hacker, a Yale University political scientist. Among other things, Hacker cited statistics showing that the size of year-to-year swings of pre-tax family income had tripled since the early 1970s, while the number of bankruptcy filings had skyrocketed from 300,000 in 1980 to 2 million in 2005. "The sociopathic imagination has another name for this enormous risk shift onto the shoulders of individual workers and families: it’s called 'labor flexibility,' and it’s a good thing. After all, would a sociopath lie about something as crucial as that? If Minsky’s focus on real-world financial behavior allowed him to see the growing dangers that most model-obsessed economists missed, there were some who represented the opposite extreme, avidly advocating the sociopathic perspective. Chief among these was Alan Greenspan, longtime chair of the Federal Reserve, first appointed by Ronald Reagan in 1987, a few months before the Crash of ’87 and the year after Minsky published 'Stabilizing an Unstable Economy.' It’s depressingly obvious which economist had the greater influence over this time period, as Greenspan’s enthusiasm for deregulation was legendary. But why associate Greenspan with sociopathy? Two words: Ayn Rand. From the 1950s, Greenspan was a member of Rand’s inner circle, deeply influenced by her ideas. And, as mentioned above, Rand chose a serial killer as the model for the protagonist of her first novel. It’s time to discuss that disturbing fact, and consider its consequences. "'A wonderful, free, light consciousness' born of the utter absence of any understanding of 'the necessity, meaning, or importance of other people.' Obviously, Ayn Rand was most favorably impressed with Mr. Hickman. He was, at least at that stage of Rand’s life, her kind of man. "He was also, Prescott goes on to note, 'a forger, an armed robber, a child kidnapper, and a multiple murderer,' the Jeffrey Dahmer of 1927/28. We need not go into the bloody details here. Suffice it to say, Ayn Rand saw the same connection between criminals and CEOs that Robert Hare did more than half a century later. The only difference was, she was rapturously enthralled by what she saw, and sought to spread the influence of sociopathy as widely as possible. 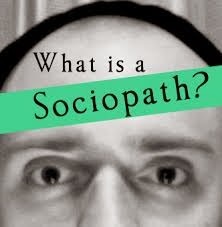 He was justifiably horrified and alarmed, and sought to counter the spread of sociopathy to the best of his abilities. "Like a true murder groupie, Rand seems more outraged at the public than Hickman probably was. But there’s an eerie similarity between her loathing for the public with their unnamed 'worse sins and crimes' and the contempt shown by the likes of Perkins and Zell for average Americans who simply long for the promise of the American Dream that their parents and grandparents once took for granted. How dare some of them seek food stamps to feed their children! Or seek unemployment insurance, simply because there are three job-seekers for every job! Surely, they are guilty of worse sins and crimes than the wheeler-dealers of the 1 percent who destroyed the economy in the first place. "This leads us to conclude with a brief focus on one way to make sense of Rand and those she’s influenced. It’s analogous to the physical phenomenon of redshift, in which light or other electromagnetic radiation from an object moving away from the observer at near the speed of light is increased in wavelength, or shifted to the red end of the spectrum. Similarly, gravitational redshifts are a relativistic effect observed in electromagnetic radiation moving out of gravitational fields, such as black holes. In like manner, for Randian psychopaths and those under their influence, normal prosocial human behavior appears redshifted menacingly as 'collectivism,' while ice-cold sociopathy appears warmed up as 'individualism.' Use your secret decoder ring to translate accordingly when you encounter those in thrall to the sociopathic imagination. You’ll always know what your Tea Party uncle is talking about — even if he, quite honestly, doesn’t have the slightest clue." Greenspan may have backtracked his remarks," but when he said he had found a "flaw in the model that I perceived is the critical functioning structure that defines how the world works, so to speak," and that "those of us who have looked to the self-interest of lending institutions to protect shareholders’ equity, myself included, are in a state of shocked disbelief," that was the quote that defined the Conservative leadership. "Use your secret decoder ring to translate accordingly when you encounter those in thrall to the sociopathic imagination. You’ll always know what your Tea Party uncle is talking about — even if he, quite honestly, doesn’t have the slightest clue." When "..ice-cold sociopathy appears warmed up as 'individualism,' you've basically described your garden variety sociopath...and when individualism turns into criminality you've basically described your garden variety Conservative.